I saw Shin Godzilla last night. I enjoyed it a great deal. I like my Godzilla grim, so the reversion to the 1954 film which treats Godzilla as a force of nature, a natural disaster, is a welcome point of view. There's a straight line from the original to The Return of Godzilla to this. Much as I enjoy watching monsters battling each other, I didn't miss it here. The drama is the conflict between Godzilla, the government response team, and the government trying to get out of its own way. Like all disaster films, the nature of the situation has to unfold, grow deeper. And in this case, Godzilla changes, thus altering the situation. I'm not going to spoil much of the film, but this is a forward-looking Godzilla, one that has new tricks up its sleeve. Like the 1954 Godzilla, it isn't until the second encounter that Godzilla uses its atomic breath. Like the original film, it's a big reveal. And then things change, and continue to change. I liked that. With these two paragraphs behind me, I will say that there isn't much new in the formula, but it's handled very well. There are a lot of people running around getting things done. Previous installments of the franchise often involved the government figuring out what to do, but this really steps it up. Like The Return of Godzilla, there is a lot of international attention given to the problem of Godzilla, and the government is put under considerable pressure to stop Godzilla or have another nuke dropped on Japan. 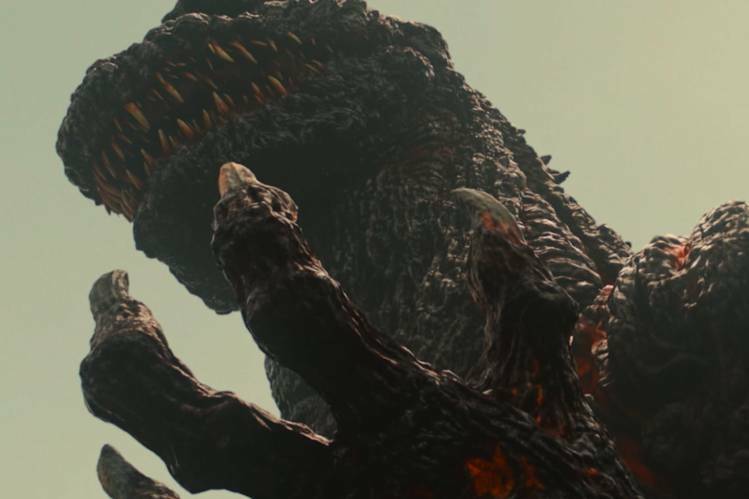 However, where that film portrays a static government confident of its control of the forces at its command, Shin Godzilla shows us a government in chaos, overlapping priorities, wrong guesses, and This leaves us with a ticking time bomb against which the scientists must race, similar to Invasion of Astro-Monster. Also, the technology to stop Godzilla is a combination of Godzilla vs Space Godzilla and Godzilla vs Destroyah. So the film is well aware of its roots, drawing on the more successful and popular entries from the franchise. The devastation of Godzilla's second rampage is astonishing. The tension is ratcheted up, the amount of damage Godzilla does seems to escalate exponentially. It's awesome. And I like the looks of the new Godzilla. It has staged growth, like Hedorah, although there's some unfortunate similarities to the evolution of a Pokemon. But this multi-stage development has been present in the franchise for longer than Pokemon have been around. I and others before me have written about the increased militarization of Godzilla films. The Japanese military doesn't get a lot of play because of the restrictions placed on it by the US at teh end of World War II. So Godzilla films have traditionally been something for the Japanese audience to enjoy military display, since Japan is being invaded. Ishiro Honda almost always portrayed the military as for display only, it never solved the problem of the monster movie plot. Part of the difficulty with the 1998 American remake was the portrayal of the military was the solution to the problem, but they had to be incompetent because otherwise the film would last as long as it took to deploy the appropriate firepower. But the military shines here, and I don't think the directors were entirely honest about it. The Japanese Self-Defense Forces is very careful, not attacking Godzilla when there are even two civilians who might get hurt. The film graces them with near-perfect certainty as to the location of civilians. And then, when the military takes it in the chin, casualties are glossed over. The big G hammers the military with its atomic ray, but the losses are never mentioned, as they are in the more nuanced Godzilla, Mothra, King Ghidorah, Giant Monsters All-Out Attack. The boom pumps (called 'cranes' in the film) used on Godzilla are similar to those used to cool down the damaged reactors at the Fukushima Daiichi plant during the nuclear disaster. That said, the first wave of boom operators, don't walk away. They are not mentioned again, but the likely future Prime Minister Rando Yaguchi is praised. Not the people who did the actual work. This ties into my old post about strong leaders. Rando sacrifices his military men, who are not mourned for their sacrifice. The camera and script lionize him for his leadership. Which, given its invocation of the Fukushima 50, seems disingenuous at best, blindly deceptive at worst. This is exactly the sort of wishful thinking Monsters: Dark Continent addresses. But that's pretty much all by implication, things the camera doesn't show. I found it a very good film, and seems likely to become one of my favorites in the Godzilla canon. Long live the franchise.